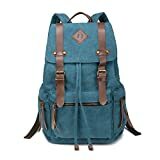 One of the essential accessories for a college going student is a great and stylish backpack. 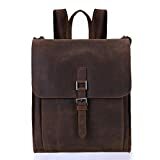 While college life to some extent is to flaunt your fashion and follow the trend, having cool belongings makes a person looks classy and up to date. 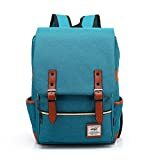 If you are looking for a great backpack for college that can accommodate all your stuff with ease and gives a comfy yet trendy look, take a glance over this piece of content. Here we have enlisted some of the most famous college backpacks of the year. Take a look and decide among these for yourself. Made with eco-friendly oxford fabric, the backpack from Zabellais stylish, trendy and durable. While the straps for carrying are protected with two layered stitches, the strong zippers ensure the safety of the belongings in the bag to the core. With the dimensions of 11.4″L x 16.9″H x 5.3″W, it can hold from notebook to laptop with ease. The multiple pockets make sure that you can put everything in an organized manner. The shoulder straps are adjustable and this backpack is for everyday use. This backpack from BLUBOON comprises genuine leather trim which gives a nice vintage look to it. Being spacious enough the bag ensures that your every belonging get placed inside it. There are a good number of interior pockets to safely place the stuff. It can hold a 15” inch laptop as well in the velcro secured pocket. The straps to hold the bag on the shoulders are adjustable and expandable. With the size of 12 X 17.8 X 6.5 inches this backpack has everything that a college student looks for. Being made up of 100% new Oxford fabric the bag is highly durable and long lasting with a cool and trendy style. With the size of 11.4 X 16.9 X 5.3 inches, the bag is spacious enough to hold almost every necessary thing required by a college going student. It can hold 15 to 15.6 inches laptop and is multi pocketed as well. The colorful and contrast designing makes it one great option to splurge upon whether you want to go for a picnic, travel, outdoor activities or college. It can hold up to 15’ laptop with ease and is made up of long lasting canvas fabric. With the dimension of 44 X 32 X 18 cm the backpack is big enough to embrace every necessary item. It comprises of one main pocket along with 2 side pockets which are zippered and 2 inner pockets for extra safety. There is one inner zipper pocket as well. This backpack is not just for college purpose but can be used casually for other outdoor activities as well. The main compartment of this college backpack can accommodate a 14-inch laptop with ease. With the main compartment, the zipper pockets are there to ensure your belongings remain safe and secure inside it. The leather trim strap along with strap closures which are made of magnet provides extra safety. The straps for the back are padded providing an ease in carrying. It comes with one year warranty and the brand encompasses 24 hours friendly customer support. Made up of durable and long lasting fabric the backpack from Furivy is unisex and can be used by both the genders. The two magnetic buckles which close the bag from outside provides an appealing look to the bag. There is a laptop compartment inside to hold a laptop as big as 15 inches. Being multi pocketed it ensures that your stuff will remain well organized and systematically placed. Genuine leather is used while manufacturing which gives it a retro look. Whether you want to take it for college, school, for gatherings or hiking, it would suit perfectly for every occasion. The backpack form LNSEA can hold 15.6 inches laptop with ease. The presence of multiple pockets at different sides makes it attractive and easy to access the belongings as well. The main compartment is secured with high-quality zip ensuring the notebook and laptops will remain safe inside it. The shoulder straps are padded and can be adjusted as per the requirement. To close the bag there are magnetic snaps which endow stylish look to it. Being properly ventilated the bag has a permeable membrane which keeps the sweat at bay and helps to carry the bag for a longer period of time. The backpack from CYREC is a multi purpose one which can be used from college to hiking without any hassle. Being light weighted one can carry it with utmost ease and this is the reason why it is one of the best selling backpacks of the time. High-quality cotton canvas is used for its manufacturing, therefore, it is comfortable to carry and stylish in appearance. The bag is spacious enough to carry every essential stuff along with a 15-inch laptop. The adjustable padded shoulder straps make it even more appealing. It comes with 18 months warranty as well. Whether one wants to use it as a college backpack or for traveling purposes, it goes perfectly fine with both of them. It is a genuine leather bag which looks extremely stylish while carrying elevating the person’s persona manifolds. 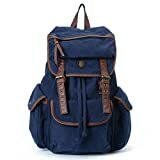 There are several pockets in the bag which make putting the belongings in a well-organized way. It comes with a warranty period of 30 days in which you can exchange t=it with any other bag of your choice unless it has not been damaged. Being very spacious this could be your ultimate choice to splurge upon. This BUG backpack comes with many alluring features and this is the reason why it has managed to attain a good position in the market. The canvas fabric which is used for its manufacturing is soft yet strong and durable providing enough comfort while carrying. The dimensions of the bag is 43 x 32 x 18cm making it large enough to accommodate all the necessary belongings. This multi pocketed backpack is suitable from formal to casual outings and therefore is liked by most of the people in the recent past.